I am happy that "people," "good," "love," "book," "books," "read," and "reading" are all high up there. Books and reading would be even higher if it was smart enough to count "book" and "books" as one word, and "read" and "reading" as one word. Also, "Shabbat" makes an appearance, as do "Talmud" and "Torah," although I would not put those high up there in terms of what this blog is about. "Shabbat" may have mostly been mentioned in connection with Brazil as well. I sure do wish that the word "fun" were larger! 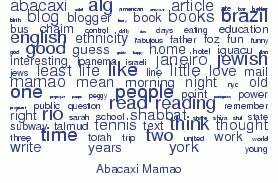 This word cloud reminds me of something that was tacked onto the bulletin board in Sharon Steiff, z"l's English classroom. It looked a lot like the word cloud above, but with letters of the alphabet instead of words from a blog. The size of the letters illustrated how often they appear in the English language. Such a thing would be very helpful to have while appearing as a contestant on Wheel of Fortune. And it was fun to look at, too. Not that I was ever bored in English class in junior high. Never! "Ms. Steiff," as I called her from 1991-1997, was my English teacher in 7th and 8th grade. This past Thursday was the second anniversary of her death on the Gregorian calendar. I learned a lot from her, although I didn't realize it at the time. I also had the good fortune to work with her in the spring of 2000, when I still called her "Ms. Steiff," because she was a formidable woman and I was scared to call her Sharon.